Thanks to our new cooperation with stalkermusic.com we are able to present the latest video report, an interview with I Walk The Line from Finland.Ville Rönkkö (voc, b) and Jani Koskinen (git) tell more about the band history, their current album "Language of the Lost" and how they avoid playing "basic punk rock"
Stalkermusic-reporters Harri Pikka and Juho Mikkonen talked with INSOMNIUM guitarists Ville Friman and Ville Vänni, who lighten the history of the band, touring and the process of making the highly acclaimed "Across the Dark" album, and more... (the interview is in Finnish language, with English subtitles). Enjoy! IRON SKY will have its world premiere on February 11 at the film festival Berlinale, in the Special Panorama category, which screens only films that push the envelope with unique vision. More screenings will follow (details at STALKER tourdates), watch the TEASER here. Iron Sky is a dark scifi comedy with an alternate take on history. Instead of flat out losing the war, a secret Nazi space program in Antarctica evaded the collapse of the Reich by fleeing to the dark side of the Moon. During these 70 years of utter secrecy, the Nazis have constructed a massive armada of flying saucers, and are now poised to attack the unsuspecting Earth. The time of the triumphant return of the Fourth Reich is at hand! With a formidable ten million dollar budget, Iron Sky is also by far the biggest movie made in the Finnish film history. The distribution rights have already been sold to over 20 territories, with ongoing negotiations to conquer regions like North America, Russia and India. Iron Sky has already spawned several spinoff projects, including a board game and a video game. 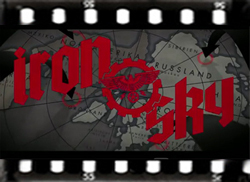 Iron Sky is directed by Timo Vuorensola, written by Vuorensola and Michael Kalesniko based on the original story by Johanna Sinisalo, and starring acclaimed actors Christopher Kirby, Julia Dietze, Götz Otto, Peta Sergeant, Udo Kier and Stephanie Paul.